Need a Custom Ventilation System for it? *Custom Ventilation ports (Customer specified port lengths - wall thickness). Each Ventilation system can take up to Two (2) fans per system. To meet EPA Standards (so you do not sufficate), you need to turn the rooms air over at least once every five minutes. 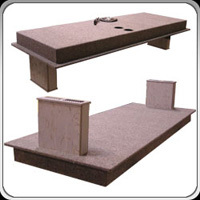 It is recommended that you use these rules of thumb when ordering systems for your room size. Call if you are unsure. For room sizes: 4' x 6' and Under - One (1) Ventilation System with One (1) fan. For room sizes: 4'x8' through 6'x8', One (1) Ventilation systems with Two (2) fans pers system would be required. For rooms sizes: 8'x8' you would need Two (2) Ventilation Systems with Two (2) fans per system. For room sizes: 8'x10 trough 8'x12' you would need Three (3) Ventilation Systems with Two (2) Fans pers system. This high tech ventilation system comes as a one piece unit for easy installation. The hardest part of building your own sound isolation booth is building a ventilation system that does not leak sound. 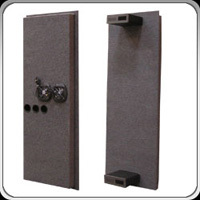 Gretch-Ken Industries, Inc. has solved this problem by offering you a pre-built ventilation system that you attach to the wall of your booth or room. Custom sizes, shapes, CFM flow, low noise fans, AC adaptors, and more.